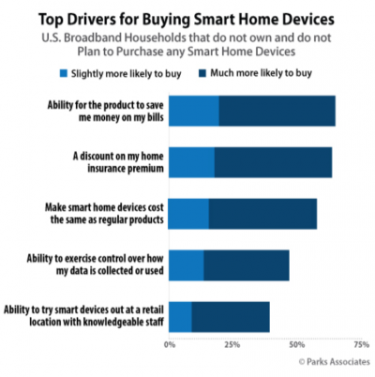 Smart-home tech might be hot, but almost half of broadband households don't want it ... unless it helps them save money, according to research from Parks Associates. Parks Associates research suggests consumers are more likely to buy a smart home device if it saves them money. More than half of U.S. broadband households might want smart-home products, but that leaves a big chunk of customers who want nothing to do with the stuff. Some 46% of U.S. broadband households currently have no intention of purchasing home automation devices, according to research firm Parks Associates. In order to nudge these customers into the "buy" category, home-tech dealers and manufacturers should show them how smart stuff helps them save. Roughly two-thirds of the non-buyers say they could be swayed by technology that reduces their bills or yields discounts on insurance premiums, Parks research suggests. Immediate cost savings, however, mean little if the customer is burdened by expensive repairs or aggravation. "To deliver on the promised savings in the connected home, the devices need to work flawlessly from installation onward," says Alton Martin, co-founder of the customer-support company Trusource Labs. "Unfortunately, this promise isn't always kept, and the end user needs help to remedy the situation." Martin is a panelist on a discussion about in-home technical support at the 13th annual Connections Summit during CES 2019. He joins integrator Jennifer Mallett of Level Up Your Home and Jeremy Hitchcock of Minim, an IoT device-discovery firm. By the way, if you think a retail shop with knowledgeable staff and in-store demos will seal the deal, think again. Only about one-third of consumers say such demos will make them likely to buy, according to Parks.